Engineering industry is one of the largest industries in India. This industry, being closely associated with the manufacturing and infrastructure sectors of the economy, is of strategic importance to nation’s economy. Growth in this sector is driven by various sub-sectors such as infrastructure, power, steel, automotives, oil and gas, consumer durables etc. The industry can be broadly categorized into two segment namely heavy engineering and light engineering. Most of the leading players are engaged in the production of heavy engineering goods and mainly produces high-value products using high-end technology. The light engineering goods segment uses medium to low-end technology. Entry barrier in this segment is low on account of the comparatively lower requirement of capital and technology and it is characterized by the dominance of small and unorganized players. The government plays an important role in developing the engineering section of the economy. The engineering industry has been de-licensed and enjoys 100 per cent foreign direct investment (FDI). Cumulative FDI in the sector totaled $ 26.6 billion over April 2000-May 2015. Growth in this industry has been fueled by growth in key end-user industries and many new projects undertaken in various core industries such as railways, power, and infrastructure. Capacity creation in sectors such as infrastructure, oil and gas, power, mining, automobiles, auto components, steel, refinery, and consumer durables has driven growth in this sector. For example, the domestic sales of automobiles have grown at a CAGR of around 20 per cent over the past four years thereby increasing the demand for engineering goods. Apart from demand from user industries, the availability of technical education infrastructure that provides an increased number of technically trained human resources each year has been another key factor aiding the engineering industry in India. Besides, India is being preferred by global manufacturing companies as an outsourcing destination on account of its lower labor cost and better designing capabilities. In the financial year 2015 Indian engineering exports surged by around 15% to $70.6 billion as compared to $61.6 billion in the previous financial year. Transport equipment remained the leading contributor to engineering exports. The segment accounted for 33.5% of the total engineering exports during financial year 2015. 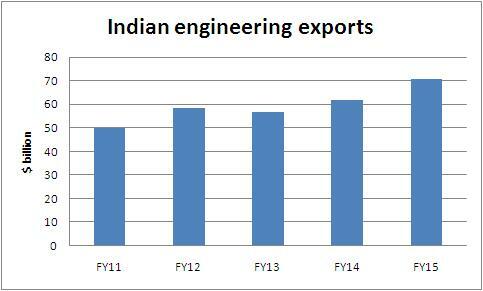 Machinery and instruments is the other major contributor with a share of 31.8% of the total engineering exports. The base metal sector (including iron and steel) contributes 32.9% to the total exports from the engineering sector. The US and Europe together account for about 60 per cent of India’s total engineering exports, as demand in key markets such as the US and the UAE is on the rise. Apart from these traditional markets, Eastern and Central European countries markets such as Poland also hold huge opportunity. India’s engineering exports to Japan and South Korea too have increased with shipments to these two countries rising by 16 and 60 per cent respectively. Hyderabad-based infra player IL&FS Engineering Services has bagged a port project worth Rs 179.84 crore ($ 28.74 million) in Maharashtra. The company has received a letter of award (LOA) from IL&FS Maritime Infrastructure Company (IMICL) on behalf of Dighi Port for engineering, procurement, and construction (EPC) contract for the development of multipurpose berth, backup yard development and utilities of multipurpose terminal berth 5 on the north of Dighi Port, Agardanda in Maharashtra. Vistara, the Tata Sons-Singapore Airlines JV, has signed an agreement with Airbus for engineering support services which include components supply and airframe maintenance. Honeywell Turbo Technologies has partnered with Tata to develop their first ever petrol turbocharged engine. The new Tata Revotron 1.2T engine launched in the 2014 Tata Zest delivers improved power and torque and a multi-drive mode. Engineers India (EIL) has inked a $139 million consultancy deal for a 20 million tonnes (MT) refinery and polypropylene plant being built in Nigeria by Dangote Group. Bharat Forge has acquired Mecanique Generate Langroise (MGL), French oil and gas machining company, via its German arm CDP Bharat Forge GmbH. The company will benefit from MGL’s expertise in precision machining and other high value processes like cladding which have critical application in the oil and gas industry. Royal Enfield, a two wheeler division of Eicher Motors, acquired UK based design and engineering company Harris Performance Products, whose expertise, knowledge and understanding of motorcycling will help Eicher Motors achieve leadership in the global mid-sized motorcycling segment. Government’s `Make in India’ campaign has received the attention of several infrastructure and engineering multi nationals including GE and ThyssenKrupp, which are considering investing in the country. The Government has also awarded a record 56 defence manufacturing permits to private sector entities like Mahindra, Tata and Pipavav, etc., in the past year to set up production units for major military equipment. Reflecting rapid expansion in military ties, Israel has announced its willingness to share cutting-edge defence technologies with India and both countries will go for co-development of a number of key weapon systems soon. Israeli Defence Minister Mr Moshe Ya’alon said both countries have overcome hurdles in co-development of Barak 8 missile defence system and work on another key project of aerial defence systems was on track. With the aim to boost the manufacturing sector, the government has relaxed the excise duties on factory gate tax, capital goods, consumer durables and vehicles. It has also reduced the basic customs duty from 10 per cent to 5 per cent on forged steel rings used in the manufacture of bearings of wind operated electricity generators. Devaluation of Chinese Yuan, Sharp reduction in demand for base metals and commodities from China is impacting exports of India’s engineering products to the neighboring country. The country’s engineering exports to China dropped by 38% in August, while total outbound shipments of such items witnessed a fall of 29.5% to $4.49 billion from $6.38 billion in the same month last year. These numbers are negating the contention that India is somewhat decoupled from slowdown in China. Outlook of Indian engineering industry is positive for long term on account of infrastructure development, favorable government policies, and new investments in power projects, metals, oil & gas, petrochemicals industries, etc. Further industrial and manufacturing growth will also increase growth in the sector. As the export market offers more opportunities to explore, India’s contribution in global engineering exports is expected to increase. Emerging trends like outsourcing of engineering services provide opportunities for growth. However, devaluation of Chinese Yuan, Sharp reduction in demand for base metals and commodities from China are impacting exports of India’s engineering products to the neighboring country.